Kindergarten and first grade students enjoy sledding as a reward for meeting their reading goals. The elementary students were able to enjoy some winter fun before the snow melted! 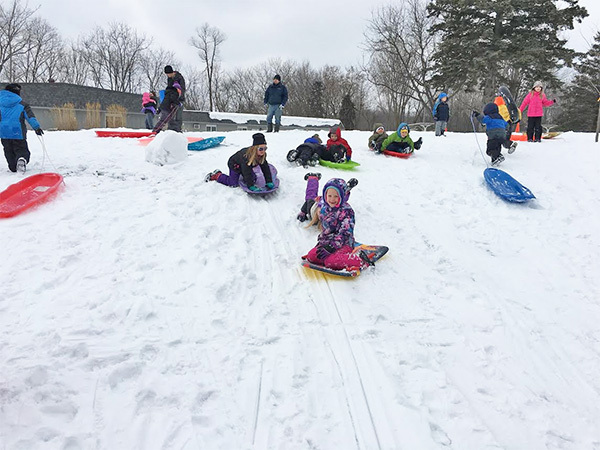 The kindergartners and first graders earned a sledding party because they have worked so hard to meet their reading goals this year. Mrs. Bialkowski, the first grade teacher, and Miss Bostic, the kindergarten teacher, wanted to celebrate their students’ successes! What better way to celebrate in the winter than with a sledding party followed by hot cocoa and a special treat! Thank you to all the moms and dads of the first graders and the kindergartners who made this celebration possible! Now they are on to setting and meeting even more goals for the year with National Reading Month right around the corner!